“If you don’t let them write full essays for a while, and make them focus on the quality of sentences, they begin to get it.” — Kim Holcomb, Ohio U.
I’m happy to explain how we used your book in my four sections of freshman writing last year. Your idea that students need to learn how to write good sentences before they can write essays struck me as game-changing, and I immediately ordered The College Writing Guide. When I first got hold of The Guide last fall, my classes were already underway, but I took a several-week detour to focus on exercises from the book, which worked to change my students’ thinking about sentences. Many of them come into college not understanding that writing is a matter of putting sentences together. They can’t tell a good sentence from a bad one—in fact, I think it’s never crossed their minds that some sentences are good and some bad. They seem to think their job is to impress with big words and overly wordy, sometimes impenetrable, sentences. Using The College Writing Guide as a workbook changed that. As you know, I first used the book in the fall. I copied pages from it and we did various exercises for three weeks, putting their first essay aside. Students loved it and many said it was the best, most useful part of the course. Since we’d had such good luck in the fall, I decided to jump in deeper and for spring semester 2016 I had them buy the book, and I incorporated it into the syllabus. We used it in both sections as a workbook for the first five weeks of the course. We worked through the different exercises at the start of the book, starting with concrete nouns and then active verbs, flipping the passive active, avoiding there is/there are constructions, and so on. If you don’t let them write full essays for a while, and make them focus on the quality of sentences, they begin to get it. Their writing improved a lot this semester—it might be the best semester I’ve had. Their sentences got a lot better. John, I’m a real fan of this book; I tell everybody about it. I’m thankful for it because I don’t have the time to invent more materials for my classes, and this package really works. 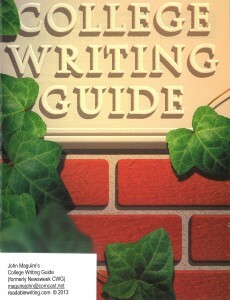 I’ve been teaching college writing for more than 20 years, and this is the best resource I’ve found. I assume you don’t mind if I put some flyers out mentioning it in the faculty lounges? I’m going to do it! If you want better writing from students, order the low-cost CWG now. Geraldine worries about "concrete nouns"